The most widely grown evergreen species in the genus, Haemanthus albiflos with its white flowers and glossy green foliage is drought tolerant and easy care. Flowering in late summer to winter it grows well in a humus rich well drained soil this is a Haemanthus species will flower in shade. Grow it in a container or in the garden and it will thrive. The white flowers are followed red fruit or berries that can be collected for propagation. This is a species that prefers shade and some moisture, it will cope with dry conditions however it will be a better plant with some moisture. As it grows naturally on forest floors and other shaded areas these conditions should be mimicked. Dig the soil over well or in a container use a good quality potting soil or compost. Plant the bulbs with the top half of the bulb itself above the ground level. Top dress each year with some well rotted compost. Water during dry periods over summer. The easiest method of propagation is by dividing the offsets, and this should be done as the weather warms a little in spring. 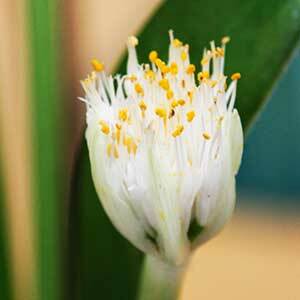 It is also possible to propagate Haemanthus albiflos from seed. Seeds are sown when fully ripe, wash them, leave them for a few days to dry and then they are ready to plant. Use a seed propagating mix and cover them with just a little of the mix (3mm). Keep moist and in shade. Common Name – White Paintbrush Plant. Height – To around .3 metres, often less. Spread – To around .1 to .2 metre. Flowers – White and typical ‘Toothbrush Shape).